Big Band Library: December 2008 "Big Band News"
It came out just in time for the holidays... a 7-CD blockbuster, "Classic Columbia and Okeh Benny Goodman Orchestra Sessions (1939-1958)," Mosaic MD7-240. While a few collectors may bellyache (in reviews posted on Mosaic's own website!) that Mosaic didn't follow its usual policy of including everything the performer did for the labels, it is "complete" given the set's focused title. For starters, every instrumental which Goodman did for Columbia and Okeh with his big band between August 10, 1939 and October 15, 1946 is here. That means the original recordings of many Goodman staples, such as Let's Dance, Stealin' Apples, Jersey Bounce, and Mission to Moscow... the fabled Eddie Sauter arrangements like Benny Rides Again, Superman, and Clarinet a la King... plus many other wonderful records, Cocoanut Grove, The Hour of Parting, Scarecrow, Tuesday At Ten, Take It, Caprice XXIV Paganini, and Gotta Be This Or That, to name only a few. Also included are some two dozen alternate takes, not counting ones that were unissued until Phontastic put them out on LP and CD. Another portion of the set are recordings done in hi-fi when Benny returned to Columbia during the 1950s, including old and new Fletcher Henderson instrumental big band charts, such as Mean to Me, Lulu's Back in Town, and Sunrise Serenade... the Swing Into Spring session of February 25, 1958 with one tune completely undocumented previously, Swanee River... and the selections made with strings for a 10" LP, "Let's Hear the Melody," containing, for example, Embraceable You, Moonglow, and Georgia On My Mind. The sound on everything is uniformly very good; it was stated in Mosaic publicity that they went back to the original Columbia and Okeh metal mothers, lacquer discs and (for the '50s tracks) reel-to-reel tapes. However, I must mention that, to my ears, it seems a little dry in spots, and I can't honestly say that, for instance, the 1951-53 Fletcher Henderson tunes sound any better than when some of them came out on the LPs "Swing with Benny Goodman" (Harmony HL 7190) and "Swing Time" (Harmony HL 7225). 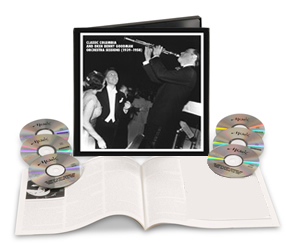 The cover and booklet feature, among others, never-before-seen images taken by photographer Charles Peterson at a New Year's Eve dance in 1938 at the Waldorf-Astoria in New York City (see the illustration above) and, 20 years later, Benny and band in the studio during the "Swing Into Spring" date, photographed by Don Hunstein. Jazz historian and former Goodman musician Loren Schoenberg has written a session-by-session analysis of the recordings, and, in a few places explains why he's not totally enthused about certain performances. Being a longtime record hunter, the enclosed discographical listing and comments make interesting reading to me, and are based on research done by Russ Connor in his Goodman volumes. Mosaic also stated that it had access to the original Columbia and Okeh ledgers and American Federation of Musicians logs to confirm the details as accurately as possible. I think that Mosaic made a wise choice in sharply focusing this set, eliminating the vocals of Helen Forrest, Peggy Lee, Helen Ward, and others with the Goodman band, since nearly every one of those selections is already presently available on CD in separate packages by Collector's Choice Music. Also, by limiting this set to studio recordings, they avoided duplication with the live 1958 "Benny in Brussels" performances originally issued by Columbia which are now available on a CD from Collectables. In spite of others' opinions and my own nit-picky quibbles, this is one to get. 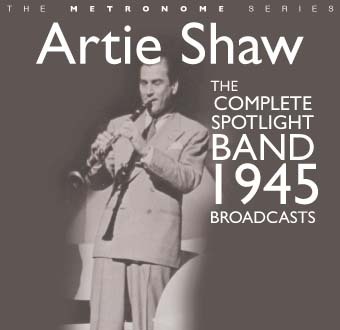 Hep Jazz ( UK ) has a must-have, new 2-CD Artie Shaw title, "The Complete 1945 Spotlight Band Broadcasts" (catalog no. 84/85), with performances from military bases in southern California, awaiting release. But there's a couple significant differences from previous issues of the material by other labels [ including the 2003 CD, "Artie Shaw: 1945 Spotlight Bands Broadcasts," Jazz Unlimited ( Sw ) 201 2088, and the CD "Spotlight On Artie Shaw" (Joyce JRC-1016), a reissue of a 1974 LP (Joyce LP-1003) ]. "These are from Artie's personal acetates," as I was told by e-mail. "The AFRS broadcasts which have been issued on the CDs you mentioned were only 15 minute edits." Guy, Summertime, It Had to Be You, and Softly, As in a Morning Sunrise. In fact, those aren't even documented in Vladimir Simosko's Artie Shaw discography! "The actual programmes were 25 minutes and held complete, not fade-out performances, plus additional tunes," it was explained by Hep. As a bonus, producer Alistair Robertson is also including three selections from the November 7, 1945 "Fitch Bandwagon" show: 'S Wonderful (previously-unissued), Night and Day, and Let's Walk. The performances have been restored by Doug Pomeroy "and are fabulous," it was promised. "Plus great photos and good notes. A fine set in all regards." Tommy Dorsey, "On the Radio 1940-1946," Acrobat ( UK ) ACTRCD 9026 [ 3-CD set ]. I've Grown Accustomed to Her Face, Soho, and Headin' North ]. 1951, incl. Eager Beaver, Southern Scandal, and Painted Rhythm ]. Frankie Masters, "Moonlight Memories," Audiophonic 80928 [ 32 songs on 2-CDs, feat. vocalists Phyllis Myles and Allan DeWitt ]. band played at two concerts in Belfast ]. Paul Weston, "A Life in Music," JSP ( UK ) 957 [ 4-CD set ]. Mosaic Records is now putting the finishing touches on another 7-CD set, "The Complete Louis Armstrong Decca Sessions (1935-1945)," due out in March 2009. "This is Satch in his prime!," it is promised in advance publicity. The package includes Armstrong in a variety of recorded settings, including the 12" medley of hits from "Pennies From Heaven" with Jimmy Dorsey and His Orchestra, Bing Crosby, and Frances Langford, plus many rare, alternate takes of other songs. Liner notes will be by Armstrong authority and friend Dan Morgenstern. Yes, those were some horns from The Count Basie Orchestra directed by Bill Hughes which accompanied singer Tony Bennett on the NBC-TV special, "Christmas At Rockefeller Center," on December 3rd. (It wasn't the full band, but a small contingent of three saxophones, two trombones, three trumpets, plus rhythm including Monty Alexander at the piano.) Bennett sang Winter Wonderland with them. Disney Concert Hall, Los Angeles, CA. Clinton Township, MI; Dec. 16, Harlingen, TX; Dec. 18-19, Pigeon Forge, TN; Dec.
so-called "Tommy Dorsey Ensemble" ] - embark and debark in Miami, FL CANCELED. RX; Dec. 22, Palmdale, CA; Dec. 31, The Coister, Sea Island, GA.
Glenn Miller Orchestra directed by Larry O'Brien: Dec. 1-14, conclusion of Japan tour; Dec.
17, Cultural Arts Center, Glen Allen, VA; Dec. 18, Catawba College, Salisbury, NC; Dec.
Capitol Theatre Center, Chambersburg, PA; Dec. 31, [ private ], Coconut Creek, FL. Legendary big band drummer and leader Louie Bellson, 84, was rushed to the hospital last month, when he suffered a fall. His wife, Francine, quipped, "We like to think he was so happy about the election that he jumped up and broke his hip!" Wishes for his speedy recovery may be entered into the "Guestbook" on his official website, louiebellson.info, or cards may be sent to him c/o Remo, Inc., 28101 Industry Dr., Valencia, CA 91355. I suggested that, once he's better, Louie might compose a jazz tune for President-elect Obama, titled Yes, We Can!. Mrs. Bellson responded, "Christopher, as always, you have excellent ideas!" Morrow '56-57), b.Dec. 1, 1925. Shangri-La, Gone with the Wind, A Stranger in Town, Release Me, 'Round Midnight ]), b.Dec. 10, 1937. Jam" LP; Ellington '51-'59), b.Dec. 14, 1920. Pete Rugolo, pianist - composer (Grier '41; Kenton '45-'49), b.Dec. 25, 1915. Abbe Lane, singer (Cugat '50s) - actress, b.Dec. 16, 1932. Tony Martin, vocalist (Noble '38; Miller AAF '43), b.Dec. 25, 1913. Frances Lynne, 82, vocalist (Barnet '48-'49; Krupa '49-'50), d.Dec. 4, 2008, heart failure. Johnny Potoker, 95, pianist (T. Dorsey '45-'47; McKinley '47; Byrne '58 Grand Award Dorsey LP), d. Dec. 5, 2008. A four-story, 32,000-square foot, multimedia Grammy Museum will open on the 6th of this month in downtown Los Angeles. Executive Director Bob Santelli says that they tried to represent every kind of music, including big band and jazz. Among the artifacts on display in the Museum are Glenn Miller's trombone, Louis Armstrong's trumpet (and his lip balm), Lester Young's saxophone, Billie Holiday's costume jewelry, and songwriter Sammy Cahn's typewriter. "This isn't a pilgrimage site," Santelli told Edna Gundersen of the Gannett News Service. "The idea is to experience music and get your hands dirty. We took technological ideas . . . to get deeper inside the music. It makes the visitor a more sophisticated listener." JCCD-3128), IAJRC Journal, Vol.41, No.4 / Dec. 2008, pp.84-85. Geoffrey Wheeler, "John Hammond and the 1938 - 1939 'Spirituals to Swing' Recordings,"
IAJRC Journal, Vol.41, No.4 / Dec. 2008, pp.48-54.